Thursday night was damp and drizzly, the afterthought of a grey, depressing day. When work ended, I had a hankering for a senseless action flick and drove off to the Alamo Drafthouse to see Raid 2. But life conspired against me. Dreadful traffic, a maze of Austin flyovers and a strict “no late entry” rule doomed my trip. Crestfallen, I looked up at the board, and despite a wash of bad reviews, decided to check out Johnny Depp’s latest sci-fi flick about the upload of a dying human’s brain into a massive supercomputer. Although I think the critics have been overly harsh, Transcendence is a poorly constructed mess with the best of intellectual intentions. Depp plays Will Caster, the world’s leading mind in the field of artificial intelligence. With his wife Evelyn (Rebecca Hall) and partner in science Max (Paul Bettany) by his side, Will is poised for a major breakthrough. But all is not well in the world of high tech and virtual geniuses. An anti AI group called R.I.F.T., headed up by Avril Lavigne look-alike Bree (Kate Mara) coordinates an attack on laboratories across the world, culminating in a successful assassination attempt on Good Will Techie. Desperate to save her husband, Evelyn, to the protests of Max, uploads his consciousness into the monster mainframe with pleasing yet terrifying results. Much like Nicholas Cage, Depp is at his best when unhinged and imaginative, at his worst when he tries to tone it down. The cinematic equivalent to intravenous anesthesia, Depp’s performance is as bland and soulless as the trumped up PC he eventually becomes. As a couple, Hall and Depp have zero chemistry, crucial for the main drive of the plot. The rest of the cast doesn’t do much better. Not even Morgan Freedman as another science guy / name on the marquee can save the robotic characters and scientific mumbo jumbo. The story itself has some interesting ideas but quickly goes off the rails thanks to terrible direction and an implausible script. The further thigns trudge along, the more confounding it gets, a direct effect of first time director Wall Pfister’s inexperience behind the camera. As a long time cinematographer, Pfister’s picture is pleasant to look at but full of terrible cinematic choices. The most jarring is an opening five minutes that completely dispels any tension from the rest of the movie. If you’ve seen the “give everything away” trailer, you can head for exits after Betanny’s somber voice over and “Five Years Earlier” captions. But even poor direction could have been saved by good writing. Not so in this case, as the lumbering, heavy handed script ultimately pushes the feature into who-cares world. Every five minutes, logic leaps out the window as you scratch your head in confusion. In the spirit of “no spoilers”, I won’t go into specifics but watching Transcendence is like listening to the ramblings of a bad liar. Have you ever had a friend whose stories never add up? Welcome to the world of Transcendence. The story structure is solely constructed to get Depp’s cranium in the machine and jerk the plot along like a truck with no tires. In a word, the story is a mangled mess. And it’s a shame because there are some solid concepts at the core. The themes of humanity, the ability to truly love something artificial and the conflict between science and morality are all fascinating. Unfortunately, there’s not enough time in a two hour movie to develop ideas, create believable characters and make a cohesive story. 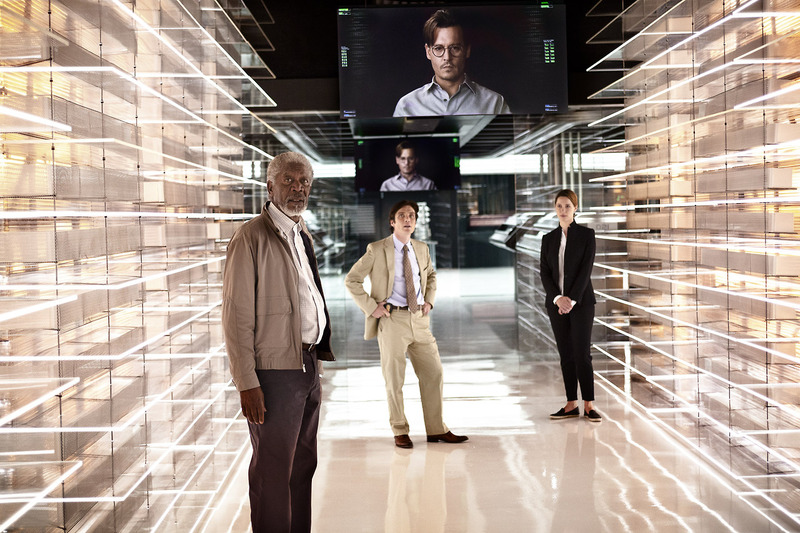 Better suited as a novel than a film, Transcendence is a perfect example of when good ideas go wrong. Poorly executed, sloppily directed and featuring Johnny Depp at his most frustratingly wooden, the debut film from Wally Pfister is another sci-fi adventure destined for the bargain bin. If only traffic had eased up and I would have made it to Raid 2. I’d probably be a much happier camper. This entry was posted on Saturday, April 19th, 2014 at 5:47 pm	and posted in Movie Reviews. You can follow any responses to this entry through the RSS 2.0 feed.